Jenna, a single mom, asks her older sister Betsy to watch her children while she attends an artist retreat to reconnect with photography. Despite her infertility issues and resulting melancholy (unbeknownst to Jenna), Betsy agrees, as she’s always been a mother figure to her unpredictable sibling. 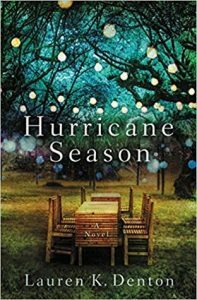 Both sisters find themselves outside their comfort zones and in turn, find their way back to each other, all this while waiting for a hurricane to hit. Denton portrays a complex sister relationship of unspoken jealousies, fears, and parental love, and how a challenging economy affects marriage and livelihood, as Betsy supplements her husband’s dairy farm with educational tours. There’s a subtle lesson in this novel to follow your heart and take responsibility for your talent, to be true to yourself. The only taint is the author’s apparent expectation of her readership all being Christian, so that the story sometimes feels preachy and insular. It doesn’t seem credible for an infertility specialist to advise a couple to pray for a natural pregnancy after a failed treatment. This is a small blemish on a wonderful story of sisterhood and authenticity. I was fortunate to receive this lovely novel through NetGalley.